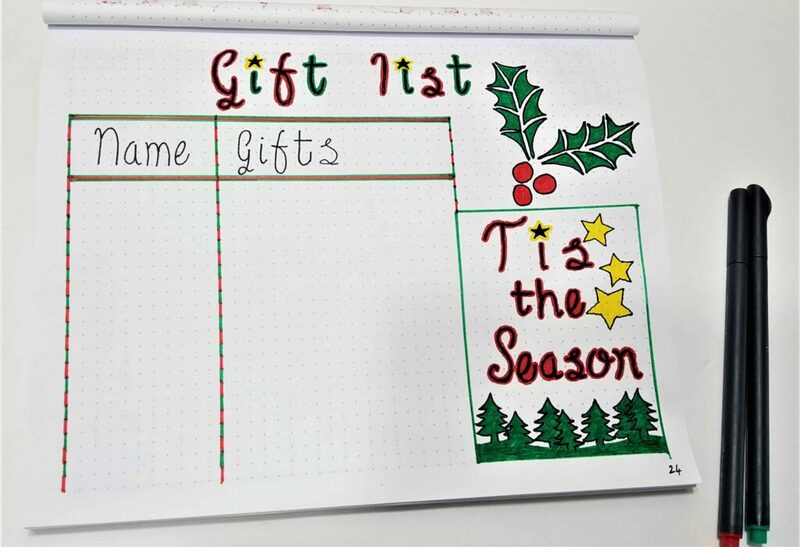 Christmas Bullet Journal Spreads - Be Organized and Less Stressed! I love everything about Fall – the food, the decorations, the smells… everything! The other thing I love about Fall is the excitement of preparing for the Holidays. Bullet Journal to the Rescue! Christmas is definitely one of my favorite holidays. Every year I have big dreams for all the fun Christmasy things we are going to do. I have ideas for crafts, food, activities, gifts.. and never do them! It seems like I always run out of time or don’t have the right supplies or ingredients for what I want to do. My Pinterest profile is FULL of Christmas ideas that I’ve never got the chance to try! So this year I’ve decided to put my bullet journal to good use and SCHEDULE the fun activities, crafts and recipes! My hope is that by scheduling them I will be able to plan ahead of time and make sure I allow enough time and have the right supplies. Presenting… my Christmas Bullet Journal spreads! My bullet journal is becoming more and more a place to track ideas and keep lists of things all in one place. I have a calendar on my cellphone that I use for most of my day to day scheduling. 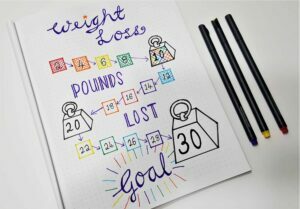 However, I need somewhere to keep track of my longer term goals (like losing weight! ), keep lists of things I want to do or see, record important dates or references. I find I have less and less time for my daily and weekly spreads (although my monthly spreads are still important to me) and I spend more time on trackers and list spreads. That’s the beauty of bullet journals – they are the ultimate personal journal! I don’t have to worry about conforming to anyone else’s idea of what a journal should be. This Christmas I will be dedicating a number of pages in my bullet journal just to planning and preparing. Christmas bullet journal pages are going to help me do more and be less stressed! 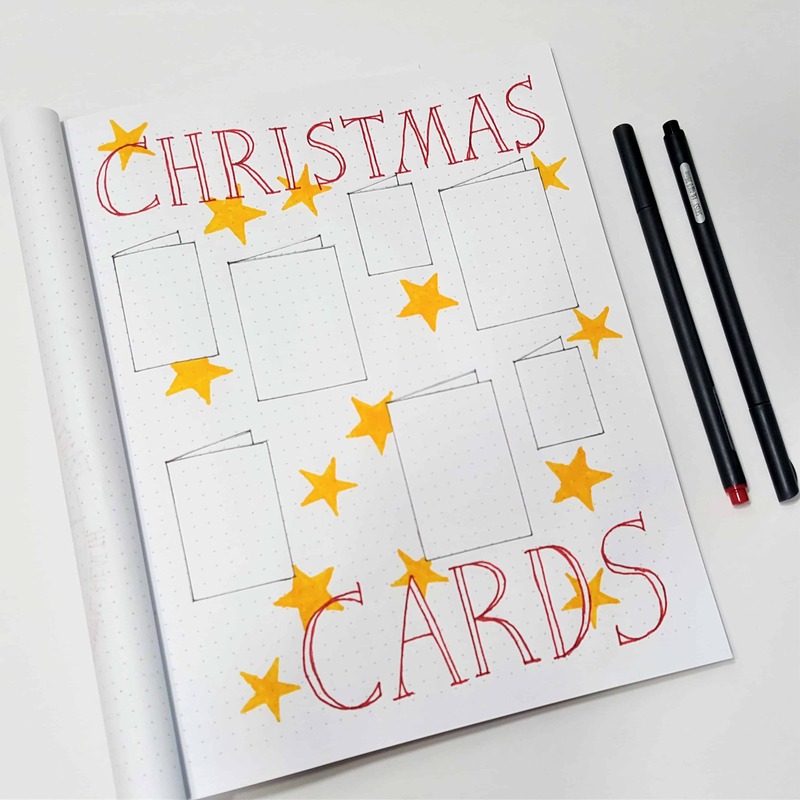 There’s so many different ways you can use Christmas bullet journal spreads to make you holiday season easier and more organized. I’ve started with 3 basic spreads, but I know I will be adding more as we get closer to December. Below are the pages and how I plan to use them to keep me uber-organized and less stressed during the holidays. When creating these spreads I wanted to make them look as festive as possible. I’m not a great artist, so I used some Holiday Stencils by Martha Stewart. Unfortunately that exact set isn’t available any more. 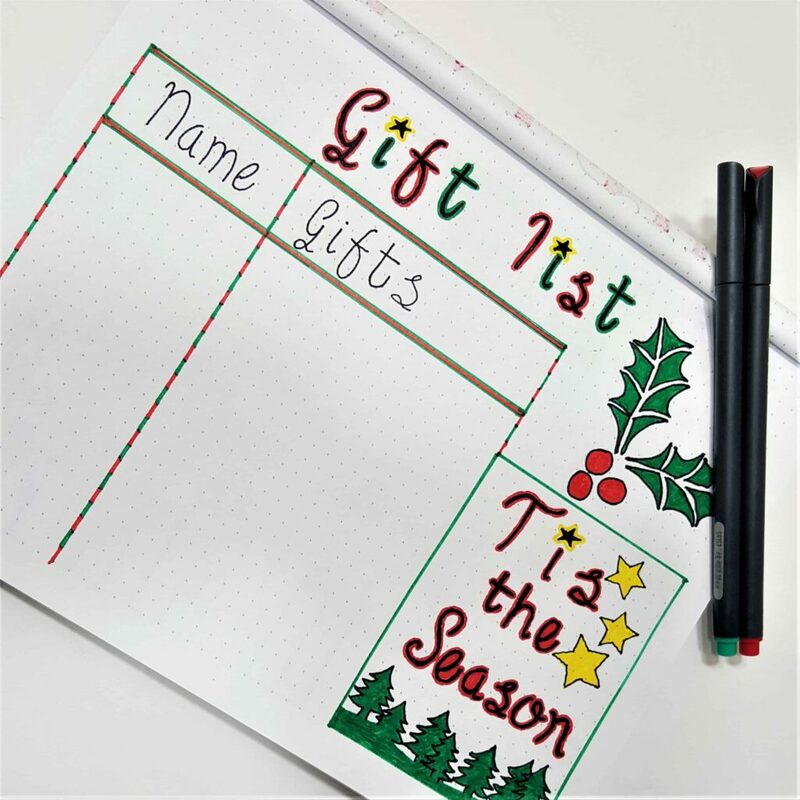 But I found this set – Pack of 4 Bullet Journal Stencils Set – which is very similar and would be perfect for your holiday layouts. With 3 children and a large family I end up buying a lot of gifts! I like to start my Christmas shopping early, it’s not unusual for me to buy things in May or June if I see the right gift at the right price! Spreading out my shopping also helps spread out the cost. One year I decided to wait and do all my shopping in November and December. The size of that credit card bill made me cry! So I’m back to spreading it out throughout the year. One problem with starting shopping so early, is that I forget what I have bought for different people. One year I bought the EXACT same toy THREE times for my son! After that I started taking photos of the gifts as I would buy them and saved them to a album in my phone. That way I could quickly check the album and see if I had already bought it. The problem with this method is that my kids like to play on my phone! Yes…. one year they found all the photos! So this year I’m going to track my gift buying in my bullet journal. I decided to do a nice colorful and festive spread for the Gift List. It makes me excited for the holidays just looking at it! Christmas cards are a dying tradition. I remember as a child that my parents would send dozens and dozens of cards (hundreds maybe?) and receive just as many. Times are changing and people just aren’t sending card anymore. I understand why people don’t send them. It’s an expensive and takes a lot of time. However, I still love to send (and receive) cards. I grew up in England where Christmas cards are bought by the box and have festive scenes on the front. When I moved to Florida, I embraced the American tradition of sending photo Christmas cards. Some of my English family and friends think it’s a little strange – but I think it’s a great way for long distance loved ones to see my children grow. Every year I make a list of who to send the cards to, and every year I forget someone! I’m sure you’ve experienced it – December 22nd and you get a card in the mail from Great Aunt Vera… who you forgot to send a card to! Darn it, and there’s no time to send her one in time! Starting this year I am going to record who I sent them to, and more importantly, who I received them from. Next year I will be able to check back on my list and make sure that EVERYONE gets a card on time! As you can see this is quite a simple spread. As I add names I might make it more festive looking. But for now it will serve it’s purpose of recording my cards. 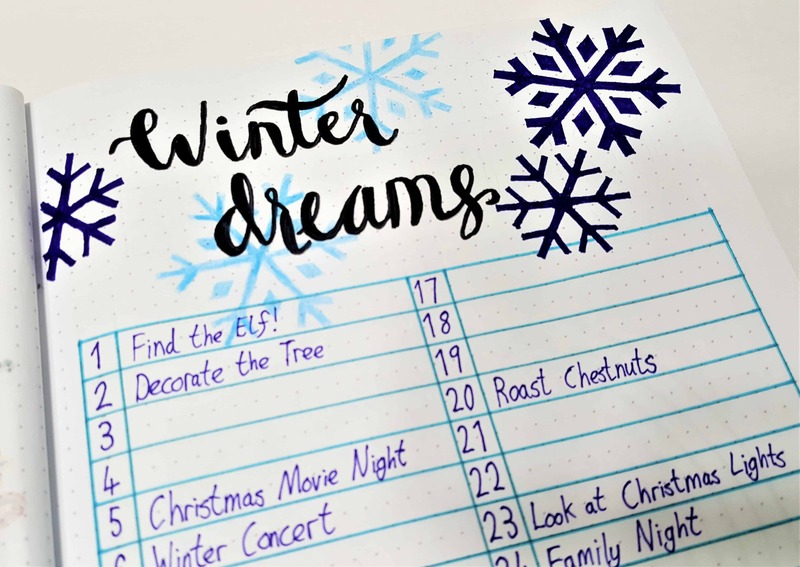 Last but definitely not least… my Winter Dreams Planner! 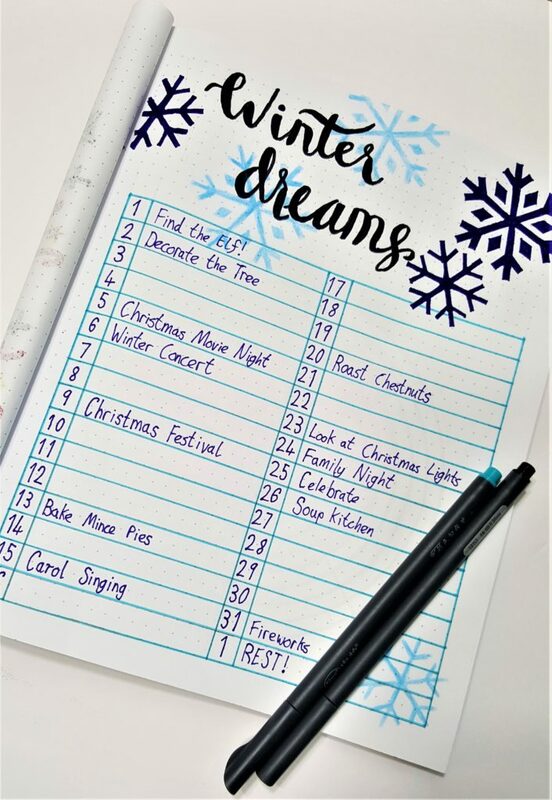 “A Winter Dreams Planner? What’s that?” I hear you ask! This is my secret weapon! This is going to be the spread that will ensure I do all those fun activities, recipes and crafts that I’ve been longing to do! I’ve divided the spread up into 32 boxes – one for every day of December (and January 1st!). As I think of ideas of things to do I will add them to a particular day. For example, I know I will be roasting chestnuts (English tradition!) on December 20th, so I need to make sure I have all the ingredients ahead of time. As you can see there is still a LOT of gaps. I need to sit down with Pinterest and find all those long forgotten holiday crafts and fill in the blank days. I’m so excited about this! It also means that I will get into the Christmas Spirit sooner and my children will have a truly magical December, filled with fun and frolics! Can’t wait! So there you have it. The three spreads that are going to help me stay organized this Christmas and reduce my stress (and guilt!). 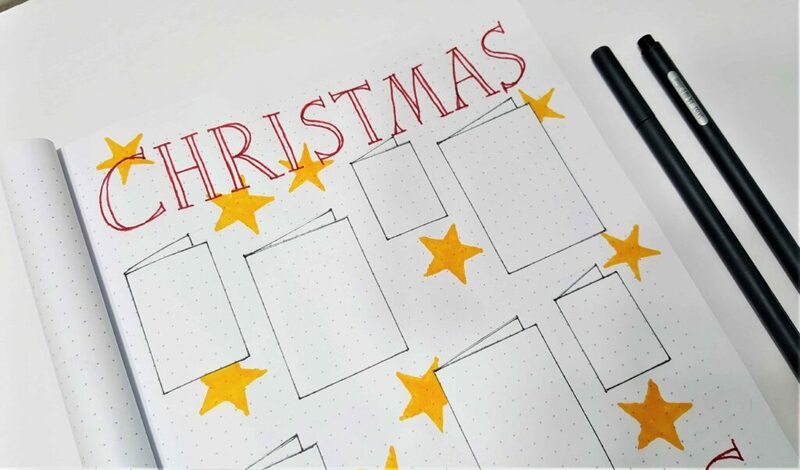 How are you using your bullet journal to stay organized this holiday season? I’d love to hear your tips – leave them in the comment section below.